RAGE is a member of the superfamily of immunoglobulin type cell surface receptors. In endothelial cells and immune cells RAGE activation is required for the perpetuation of the immune response, whereas in neuronal cells RAGE activation leads to neurite extension and stimulates neuronal survival. RAGE is a 35kD transmembrane receptor composed of an extracellular moiety, a single transmembrane helix and a short cytosolic domain. 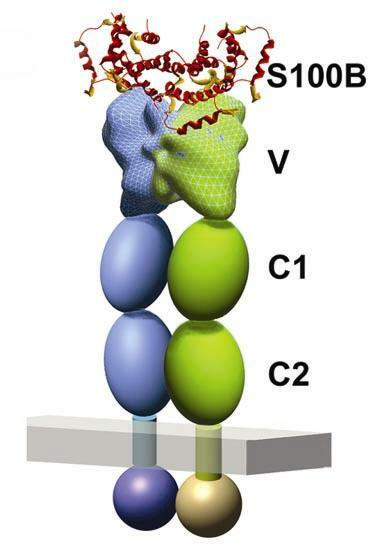 The extracellular moiety is built up by three immunoglobin (Ig)-like domains, one V-type Ig domain at the N-terminus, followed by two C-type domains (C1 and C2). The receptor is strongly activated by cross-linked AGE modified proteins. This observation implicates that receptor activation is achieved by receptor dimerization through the ligand. We found that S100B mulitmers bind with high affinity to RAGE and induces the formation of a signalling complex. 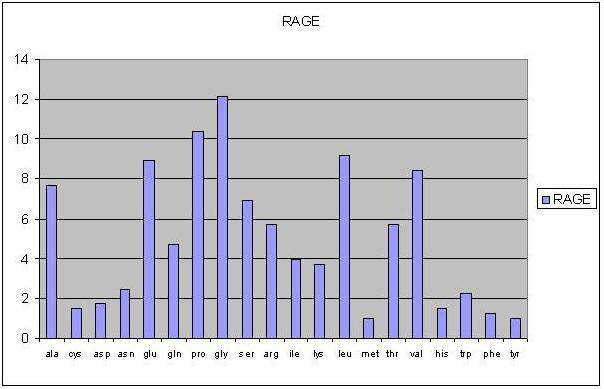 Isoforms of the RAGE protein, which lack the transmembrane and the signalling domain (commonly referred to as soluble RAGE or sRAGE) are hypothesized to counteract the detrimental action of the full-length receptor and are hoped to provide a means to develop a cure against RAGE-associated diseases. The receptor for advanced glycation end products (RAGE) is thought to be a primary transporter of amyloid across the blood - brain barrier (BBB) into the brain from the systemic circulation, while the low-density lipoprotein receptor-related protein (LRP-1) mediates transport of -amyloid out of the brain. While some circulating Aβ may enter the brain via a "leaky" blood - brain barrier (BBB) , active transport of Aβ across the BBB does occur, where a number of Aβ receptors have been discovered . Two of the better characterized are the receptor for advanced glycation end products (RAGE) and the low-density lipoprotein receptor-related protein (LRP)-1. RAGE binds a wide range of molecules, including the products of nonenzymatic glycoxidation (advanced glycation end products, or AGEs), Aβ, proinflammatory cytokine-like mediators in the S-100/calgranulin family, and a DNA-binding protein, amphoterin . LRP-1 is a member of the LDL receptor family. It functions both as a multi-functional scavenger and signaling receptor and as a transporter and metabolizer of cholesterol and apolipoprotein E (apoE)-containing lipoproteins. Like RAGE, LRP-1 binds a wide range of ligands, including apoE, α2-macroglobulin, amyloid precursor protein, and Aβ . Transport of Aβ from the bloodstream into the brain is mediated by RAGE , and Aβ transport from the brain into the bloodstream is mediated by LRP-1 . The net flux of Aβ into or out of the brain is the algebraic sum of the inward flux and outward flux and presumably depends upon the density and activity of these two receptors. To determine whether there are Alzheimer's disease (AD)-related changes in these BBB-associated β-amyloid receptors, were studied RAGE, LRP-1, and β-amyloid in human elderly control and AD hippocampi. In control hippocampi, there was robust RAGE immunoreactivity in neurons, whereas microvascular staining was barely detectable. LRP-1 staining, in contrast, was clearly evident within microvessels but only weakly stained neurons. In AD cases, neuronal RAGE immunoreactivity was significantly decreased. An unexpected finding was the strongly positive microvascular RAGE immunoreactivity. 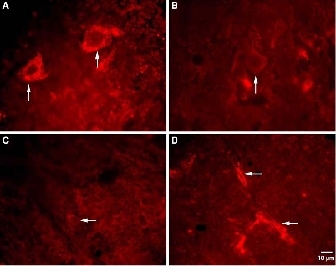 No evidence for colocalization of RAGE and β-amyloid was seen within either microvessels or senile plaques.A reversed pattern was evident for LRP-1 in AD. There was very strong staining for LRP-1 in neurons, with minimal microvascular staining. Unlike RAGE, colocalization of LRP-1 and β-amyloid was clearly present within senile plaques but not microvessels. Western blot analysis revealed a much higher concentration of RAGE protein in AD hippocampi as compared with controls. Concentration of LRP-1 was increased in AD hippocampi, likely secondary to its colocalization with senile plaques. These data confirm that AD is associated with changes in the relative distribution of RAGE and LRP-1 receptors in human hippocampus. They also suggest that the proportion of amyloid within the brains of AD patients that is derived from the systemic circulation may be significant. It has been suggested that one cause for amyloid accumulation in the brain of aged and AD patients is an age-related inability to clear Aβ from the brain. Two primary clearance routes from the brain exist for Aβ. The main route, in healthy young adults, is across the capillary endothelium; whereas a lesser amount is cleared via diffusion and bulk flow of interstitial fluid and Cerebrospinal fluid (CSF). Aged primates show an accumulation of Aβ in blood vessel walls and in the perivascular brain tissue that appears to result from a loss of LRP-1 transport. It has also been shown that Aβ transport clearance across the BBB in mice decreases significantly with age. Comparing 3 - 9-month-old mice, there is a 50% decrease in LRP-1 function in the latter. It has been shown not only that LRP-1 immunoreactivity on endothelial cells is reduced in AD, but there also appears to be an increase in endothelial RAGE immunoreactivity. Taken together, the result is a net increase in Aβ transport into the interstitial space of the brain in AD. This added Aβ is likely to be in excess of what can be removed via CSF turnover and clearance, which is also reduced in AD. The immunofluorescence, quantitative immunohistochemical, and western blot data suggest not only a shift in the localization of RAGE receptors from neurons to capillary endothelial apical membranes, but also an increase in total RAGE protein. It is not yet clear whether this increase in capillary RAGE is due to an increase in expression locally, or results from an effect of increased soluble RAGE generated elsewhere. Because the immunoreactivity localizations of RAGE and LRP-1 are apparently reciprocal, as noted above, we expected LRP-1 levels to be decreased in whole brain homogenates of AD hippocampus when compared to controls.Thus, it was initially surprising to find that the levels of LRP-1 were actually increased in AD hippocampus . 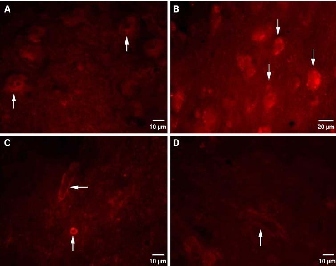 Although it has been shown by immunostaining that increased LRP-1 is present in AD neurons, that does not completely explain why total LRP-1 is increased in AD hippocampus, given that severe AD is associated with significant neuronal loss. The likely explanation is found in LRP-1/Aβ colocalization experiment, where is showed that LRP-1 colocalizes with Aβ in senile plaques. Total LRP-1 in whole brain homogenates of AD hippocampus increases because LRP-1 is intimately associated with the large numbers of senile plaques in our severe AD cases. Colocalization of LRP-1, but not RAGE, with Aβ in senile plaques suggests a possible relationship between the loss of capillary LRP-1, the increase in neuronal LRP-1, and the toxicity of Aβ. It has been suggested that LRP-1 on the endothelial cells of the blood - brain barrier, as well as on neurons, can mediate clearance of the toxic Aβ species, but this ultimately leads to their demise. Reduction of Aβ efflux results from LRP-1/Aβ-mediated endothelial cell death; increased neuronal clearance of Aβ via LRP-1 with subsequent neuronal death may be one of the early events in the pathogenesis of AD. In conclusion, these data demonstrate that AD is associated with significant changes in the relative distribution of RAGE and LRP-1 receptors at the BBB in human hippocampus. The data also support the hypothesis that vascular amyloid deposition increases within the brains of AD patients. This implies that amyloid from the systemic circulation may be a major contributor to the brain amyloid burden in severe Alzheimer's disease. (b). Note also the weak micro- vascular staining (arrow) in control brains©, compared with the robust vascular stain-ing (arrows) in AD brains (d). Fig. 2 Human hippocampal sections stained with LRP-1 antibody conjugated to Cy2. a and c represent control brains, while (b) and (d) represent AD brains. Note the weak neuronal staining (arrows) in control brains (a), compared with the robust neuronal staining (arrows) in AD brains (b). Note also the robust microvascular staining (arrows) in control brains©, compared with the weak vascular staining (arrow) in AD brains (d). Impaired memory and synaptic loss occur before extensive deposition of amyloid in the brains of AD-type murine models and AD patients; These observations suggest that early in AD, when levels of Aβ are low, mechanisms amplifying and focusing the effects of Aβ on cellular targets contribute to neuronal dysfunction. Previous studies showed that Aβ affects synaptic plasticity in the hippocampus . In particular, oligomeric Aβ42 was capable of acutely inhibiting long-term potentiation (LTP), one form of synaptic plasticity that is thought to underlie learning and memory. Stress-related protein kinases, such as JNK and p38 MAPK, are activated in several pathologic processes, including AD neurodegeneration and Aβ42 cytotoxicity. 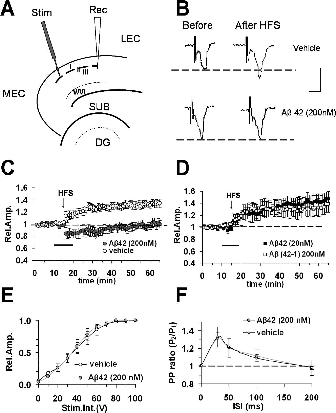 It is noteworthy that both JNK and p38 MAPK inhibition prevented Aβ-induced LTP impairment in hippocampal slices. Perfusion of the p38 inhibitor in the presence of Aβ42 restored normal LTP. LTP amplitude was not significantly different between SB203580-treated and vehicle-treated slices. In contrast, a specific inhibitor of JNK failed to rescue LTP in Aβ42-treated slices. Input - output curves, as well as short-term plasticity properties (PP ratio), did not differ between SB203580- (1 µM) or SP600125 (20 µM)-treated slices and controls. A few reports have shown that administration of Aβ at low µM concentrations can depress synaptic transmission by regulating glutamate receptors trafficking. Moreover, higher levels of Aβ, thought to be present in intermediate/late stages of neurodegeneration, may affect synaptic transmission and LTD in addition to LTP by regulating trafficking of AMPA- and/or NMDA-receptors. Interestingly, studies conducted in animal models of AD characterized by progressive accumulation of Aβ42 have shown that LTP disruption occurs before deficits in basal transmission. Thus, these results in animal models of AD and synthetic Aβ lend support to the concept that impaired LTP characterizes an early stage in AD progression corresponding to a low Aβ load. Later stages in AD progression are associated with a greater Aβ load and also affect basal synaptic transmission and LTD. Figure 3. Inhibitory effect of Aβ42 on LTP in entorhinal cortex slices. A, Schematic drawing of entorhinal cortex slices and position of electrodes. MEC, Medial entorhinal cortex; LEC, lateral entorhinal cortex; DG, dentate gyrus; SUB, subiculum. B, Representative field potentials recorded before and 50 min after HFS in vehicle-treated slices and in slices treated with Aβ42 (200 nM). C, LTP was induced by HFS stimulation in vehicle-treated slices (open circles), whereas LTP expression was blocked by bath application of Aβ42 (200 nM, gray circles) for 10 min (dark bar). D, No effect on LTP expression was observed in the presence of reversed peptide Aβ (42 - 1, 200 nM, open squares) or a low concentration of Aβ42 (20 nM, filled squares). E, Input - output curves. The relative amplitude (Rel. Amp.) as a function of stimulus intensity (Stim. Int.) measured in volts (V) did not show significant differences between vehicle-treated (open circles) and Aβ42-treated slices (gray circles). F, Paired-pulse facilitation. Paired-pulse-induced change was calculated as the ratio of the peak amplitude of the second evoked field potential to the first one (PP ratio) for different interstimulus intervals (25 - 200 ms). PP ratio was not modified in Aβ42 (200 nM, gray circles) treated slices respect to vehicle-treated slices (open circles). To investigate the effects of endogenously generated Aβ on intracellular signaling pathways and viability mitochondrial transgenic cybrid models of sporadic AD (SAD), which overproduce Aβ compared to control (CTL) cybrids, were used. Studies using this technique have demonstrated that the COX deficits in AD platelets can be transferred. Mutations in mitochondrial cytochrome c oxidase genes segregate with late-onset Alzheimer disease, and the resulting AD cybrid cells (SAD) have elevated intracellular and extracellular levels of Aβ that are normalized by antioxidant or caspase-3 inhibition. In order to assess whether decreased viability of SAD cybrids is associated with the Aβ processing, we treated SAD cybrids with either pepstatin A or γ-secretase inhibitor and examined for caspase-3 activity by proxy, i.e., PARP cleavage. Were found evidence of PARP cleavage to the 86-kDa C-terminal fragment by Western blot analysis in SAD cybrids that was practically undetectable in CTL cybrids. PARP cleavage was also not seen in SAD cybrids pretreated with either pepstatin A, γ-secretase inhibitor I, or the broad-spectrum caspase inhibitor. Since these findings suggested that blocking Aβ production by inhibiting γ-secretase activity enhanced SAD viability, were sought to determine if Aβ would elicit in CTL cybrids the same signaling events seen in resting SAD cybrids. As a first step, were determined the effects of Aβ on CTL cybrid viability after 24-h incubation The effects of different concentrations of Aβ were examined and found that they caused neuronal death, respectively, of CTL cybrids. In contrast, the control peptide Aβ 42-1 was not toxic. The cell death induced by Aβ at 5 μM for 24 h was found to be due to apoptosis, based on the morphological findings characteristic of apoptosis such as nuclear condensation and fragmentation. The neurotoxic response to Aβ fragments correlates with activation of MAP kinase cascades in several cell systems. Then were tried to define the upstream signaling steps that mediate the effects of Aβ in CTL cybrids and determine if they were similar to those active in SAD cybrids under basal conditions. Exposure of CTL cells to Aβ activated a tyrosine kinase-based intracellular signaling cascade. The pattern of protein tyrosine phosphorylation elicited by Aβ was qualitatively similar to that seen in resting SAD cybrids; however, the relative phosphotyrosine content of the individual proteins varied. Increased phosphotyrosine signaling in SAD cybrids was normalized by γ-secretase inhibitor, suggesting that it was mediated by increased Aβ production. To study the role of JNK and p38 in Aβ-induced neuronal death, the effects of the inhibitors of JNK (JNK inhibitor I) and p38 (SB203580) on CTL viability following exposure to Aβ were examined. Both SB203580 and JNK inhibitor I significantly protected CTL cybrids against Aβ-induced cell death compared to cybrids treated with Aβ alone. This suggests that JNK and p38 activation may be an important event in Aβ-induced neuronal death. To determine the role of RAGE in Aβ-induced neuronal death, anti-RAGE IgGs were used. Cells were pretreated with anti-RAGE antibodies prior to addition of Aβ and p38 and JNK phosphorylation assessed by Western blot analyses. Anti-RAGE IgGs blocked Aβ-induced phosphorylation of p38 and JNK. So, there are three major findings of this last study. First, SAD cybrids have increased apoptosis that is almost completely inhibited by reducing γ-secretase activity, implying that the increased intracellular and/or extracellular Aβ levels in SAD cybrids mediate increased apoptotic cell death. Second, exposure of CTL cybrids to 5 μM Aβ reduces CTL cybrid viability to basal SAD levels and replicates the intracellular signaling changes seen in resting SAD cybrids. The underlying mechanisms for the decreased viability appear to involve increased activity of the p38 and JNK pathways in the face of a weak and apparently ineffective Akt and NF-κB activation. Third, RAGE blocking antibodies quench Aβ-induced activation of the p38 and JNK pathways and reduce the neurotoxic effects of Aβ on CTL cybrids, demonstrating that RAGE mediates adverse Aβ actions in cybrid models of SAD. 4. Goedert Michel and Spillantini Maria Grazia .(2006). A century of Alzheimer's disease. 5. Onyango IG, Tuttle JB, Bennett JP Jr. Altered intracellular signaling and reduced viability of Alzheimer’s disease neuronal cybrids is reproduced by beta-amyloid peptide acting through receptor for advanced glycation end products (RAGE). Mol Cell Neurosci. 2005 Jun;29(2):333-43.